My poor friend Katie, I’ll get to my car after shopping at Michael’s and take a photo of something on my iPhone and email it to her. These cupcake liners were one of my emails. Her and I were taking the reins in planning our friend Kalena’s party. Kalena, if anyone knows her, is MISS PINK. She loooves pink, and purple is a close second. So I KNEW I had to PINK IT OUT! As soon as I got home I googled “Hot Pink Cupcakes” and it lead me here, which took me here. Oh yes, these were most definitely pink!! Under the High Chair adapted these cupcakes from a recipe Joy the Baker posted; I adore Joy the Baker, so I knew these would be good! These were better than good, they were great! 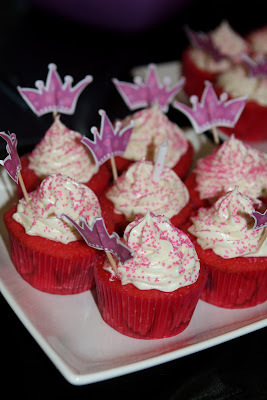 I’m not sure about anyone else, but my tastebuds picked up on the kosher salt in the cupcakes. I liked it. It’s hardly noticeable but I think it helps with the sweetness. And OMG, the brown sugar cream cheese frosting was TO-DIE-FOR. Wow! Yum yum yum! 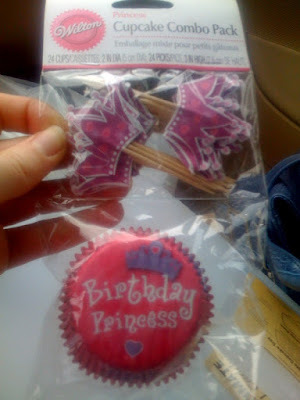 I’m going to give you the recipes, but first I’ll show you how I carried along the pink/purple/princess theme. I made these poms with directions from Martha Stewart. 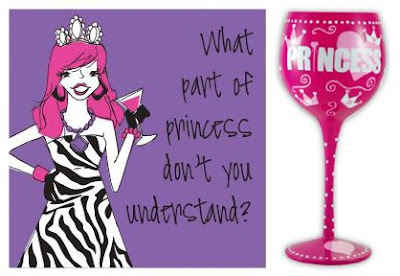 I obsessively called about bought these napkins, and this pimp cup princess chalice from Swoozies. Preheat the oven to 325. Sift together flour, baking powder and baking soda. Add the kosher salt after sifting and set aside. Measure out the buttermilk and red food coloring. Add the dye to the buttermilk for easier incorporation later. Cream the butter and the sugar using an electric mixer, until the mixture is pale and fluffy. Add the eggs one at a time, letting the eggs beat for 1 mintue in between additions. Scrape down the bowl in between additions. Add vanilla and beat well. Add the dry ingredients alternately with the wet ingredients. Start by adding one third of the flour mixture. Mix just to incorporate. Add half of the buttermilk. Add another one third of the flour mixture. Mix to incorporate. Add the last half of buttermilk, followed by the last third of flour. Spoon into paper lined cupcake pans. Check the cupcakes after 12 minutes. What a great spread and I’m digging the princess theme! Every once in awhile, that blond tv host knows what she’s talking about (rare…but it does happen!). Everything turned out great! The brown sugar frosting sounds fabulous! I’ll be sure to try it! Nice job! Those cupcakes are VERY pink indeed. What a lucky friend you have – these look great! And I love HWTM too! 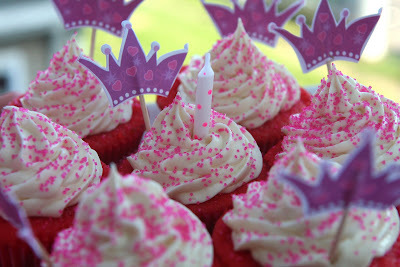 Pink is my favorite color, I love the cupcakes! Everything looks great! I love all the pink! 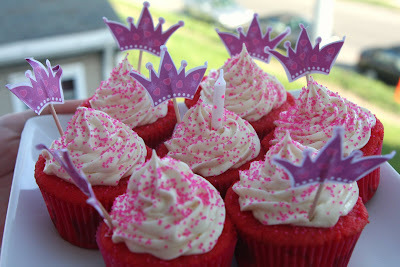 Awww, what a sweet friend you are – the pink cupcakes are super cute! Wow! These are beeeeautiful cupcakes. CUTE! I can only imagine her reaction! why is that other pom pom NOT pink????? kidding 🙂 looks like you had a swell time! the cupcakes look unbelievable! 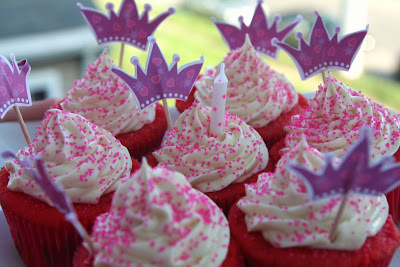 Those hot pink cupcakes are fabulous! I have many pink girlfriends that would totally love them. I haven’t made that brown sugar cream cheese frosting yet but it’s definitely on “the list”. Great job hostess with the mostess! How fun was that! Love the napkins. Ha- I just figured out I can comment using my Gmail account, so get ready. The decor, the chalice, the napkins, the food (oh, the food! 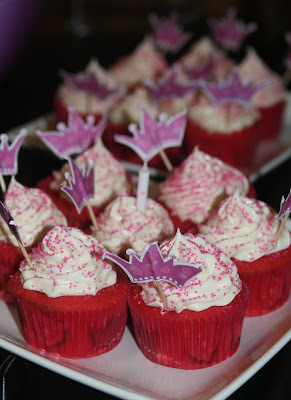 ), and the cupcakes…topped off with a spectacular ride aboard a fire truck driven by Ol' Greg. Best. Birthday. Ever. I made these for my mom’s birthday, they turned out wonderful! 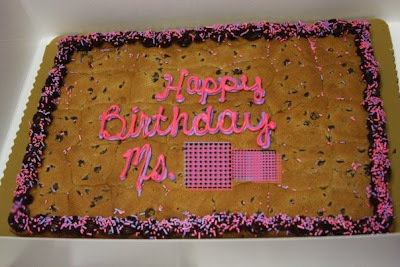 They had a kind of sugar cookie flavor to them, everyone loved them and nothing went to waste! I didn’t make the frosting for these due to time reasons, but have made it and a chocolate cake and it was wonderful. I have some buttermilk to use up so I will be making these again this evening. Definite keeper! These were really good. I made these tonight while I was watching a friends 4 year old, also with my 3 and 2 year olds. They had sooo much fun and loved seeing the color of the batter change color. I made with a light pink tinted whipped cream and filled with french vanilla custard pudding and topped with shredded coconut. My two boys didn’t mind that they were bright pink, in fact loved it, and the girl I was watching said she felt like a princess lol.